The Hummer H3T concept is what we can call a two door truck concept taken to a whole new level. The stylish looking pickup truck concept is more compact as compared to the H1 and H2 giant from the brand. Unveiled at the Los Angeles Motor Show, the H3T concept is one tough vehicle to behold. Combining its dimensions, powertrain and the skillfully designed exterior, the Hummer H3T comes out to be one such vehicle that capable of reaching out to a bigger and wider market as compared to the earlier truck line up from General Motors viz. Hummer H1 and Hummer H2. Huge wheels, a striking grille along with perfectly complimenting headlamps and a masculine hood, all pour into the awesomeness of the vehicle. The Hummer H3T concept was launched with intent of offering to the market, a new sense of styling and performance that could give a glimpse or possible defines the upcoming vehicles from the brand. 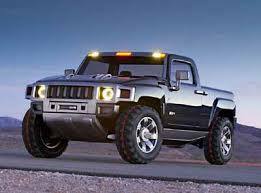 More truck-like, compact and more promisingly designed, the Hummer H3T concept effectively epitomizes the evolution Hummer’s design has witnessed over the years. While is essentially looks like a Hummer, it also boasts a younger and masculine panache. The signature “wheels-at-the-corner” stance is still present. Along with the rugged features that the vehicle boasts on the outside, the makeup it sports makes use of just the perfect color the Hummer H3T needed. Shades like Satin Titanium Alloy or Petrol Blue Metallic add to the brawny and strong look of the vehicle. There still remains a debate that if it hits production, whether the Hummer H3T will be presented in a pickup version just like the concept or will there be an alternative SUV version. With the moniker of Hummer attached with a vehicle comes great responsibility. It is like there is some threshold value of qualities that need to be there when you say Hummer H3T. One of which has to be the vehicle’s ability to smoothly navigate through exigent terrains. When the wheels are called huge, it means that the Hummer H3T concept rolls on tires that are as tall as 34 inches and wide for about 19 inches. Over all off road dynamics of the vehicle is just what one expects from a Hummer. A Vortec 3500 inline five-cylinder engine is what powers the rugged and mighty Hummer H3T concept. Good for about 350 ponies, the engine produces an equal amount of torque as well. The impressive inline engine is mated to a Hydra-Matic 4L65-E four speed transmission. The heavy duty transmission is electronically controlled. The whole engine works wonders on a challenging terrain making it an easy drive to pass through steep rises and falls. On the inside, the Hummer H3T is not as luxurious as royalty but it provides a fair amount of comfort for a pickup truck. The interiors sport a fun play of colors including paprika orange, chamois and petrol. While there is no leather or wood show off in the Hummer H3T, the vehicle has been adorned with premium quality materials to make the interiors appear, and feel, as classy as possible.